We had a bone shaped dog cake on display at a pet trade show. Throughout the day, a little girl kept coming by and standing in front of the cake, just staring at it. It turned out that it was her dog's birthday the next day of the show and she wondered if she could give her dog, Princess, a piece of cake. That gave us a great idea. We told the little girl that we were going to have a birthday party for Princess. 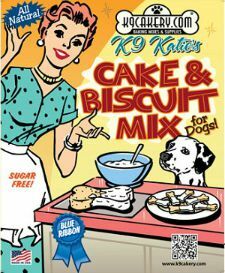 We decided to bake a dog cake using K9Katie's Cake and Biscuit Mix, and we did not add any additional flavorings or ingredients. Therefore, it was basically a human cake! The main difference was that the cake mix did not contain sugar like regular cake mixes found in the grocery store. We would serve both dogs and humans a piece of cake. That night after the show we ran out and bought a bottle of champagne, cups, paper plates, forks, candles and balloons. The next day we invited the neighboring vendors to a dog birthday party at 3 PM. The little girl kept coming by to make sure that Princess' cake was still there. She told us that Princess got a new outfit for her birthday as well. 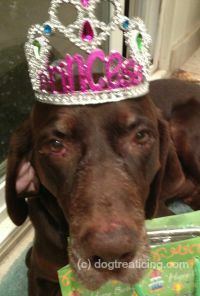 A dog birthday party for Princess! 3 PM. We lit the candles, gathered a crowd, and sang happy birthday to Princess, who looked stunning in her new outfit. We poured cups of champagne and cut small pieces of cake. There were quite a few four-legged guests in attendance. The cake was a big hit. Most of the pet owners tried the cake for themselves. The kids especially delighted in having the same cake as they were offering to their pets. The cake was basically a blander version of typical birthday cake and went very well with champagne. Most asked for seconds. There were a few who looked at us skeptically. "Dog cakes? Does it have Alpo in it?" They had never heard of baking a cake for dogs. But once they saw it and tasted it, they wanted the recipe for their own pets. We provide various recipes for you to make your own dog birthday cake or pet cakes for any occasion. The ingredients are healthy and human grade. Dogs are not picky about sweetness so there is no need to add sugar as you would do for a typical "human" recipe.